One way to sync entrance animations is to change the timing of objects manually. Just drag objects left or right along the timeline to adjust when they appear (or animate in). To sync exit animations, just change the duration of objects. 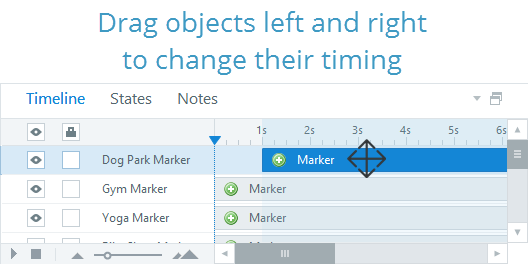 Drag the right edge of an object along the timeline to adjust when it disappears (or animates out). This displays the object until the end of the slide. This displays the object for the entire duration of the slide. This lets you specify the exact start time and duration of the object (in seconds). Go to the slide where you want to sync animations and open the timeline. Click the play/pause button in the lower left corner of the timeline to play the slide audio. Right-click the object on the timeline that you want to animate and select Align to Playhead. Repeat steps 2–4 until you've synchronized the entire slide. Another way to sync animations is to use cue points. Cue points let you precisely align objects on the timeline. First, you'll need to place cue points on the timeline where you want animations to occur (see details below). Then, right-click each object on the timeline, scroll to Align to Cue Point, and choose a cue point. Right-click anywhere in the timeline and select Create Cue Point at Playhead. Tip: To add cue points on the fly, click the play button in the lower left corner of the timeline, then press C on your keyboard at any point where you want to insert a cue point. Right-click the cue point marker you want to delete and select Delete Cue Point. 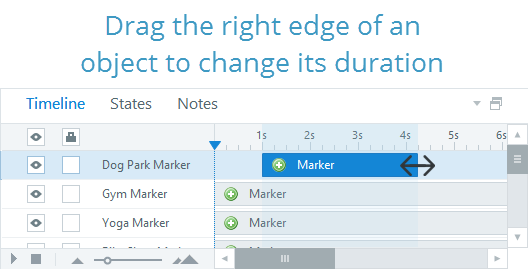 Drag a cue point marker left or right along the timeline to reposition it.